There’s only one surefire way to prevent SQL injection, the #1 most frequent and damaging application security attack: verify that your code does not have SQL injection vulnerabilities. SQL injection allows hackers to steal or modify everything in your database. Code review is the most effective analysis technique for finding SQL injection flaws, and it also pinpoints exactly where the flaw is located, making it much easier and faster to remediate. If your organization is still solely focused on application penetration testing, you are wasting your time and putting your organization at risk. 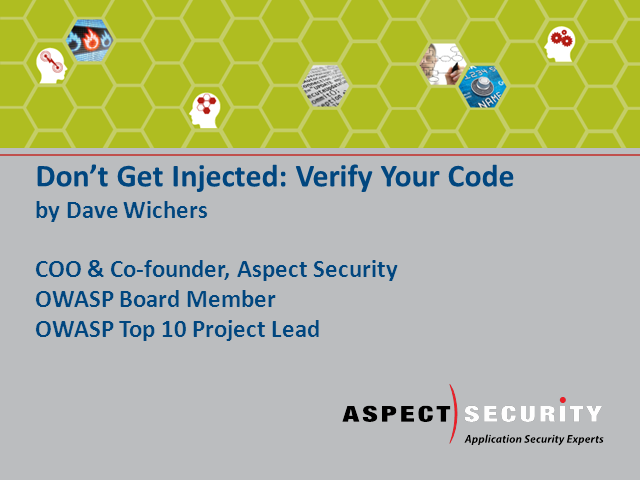 Join Dave Wichers and learn about the simple genius of performing application code review to efficiently identify vulnerabilities in your applications.